At one of the last Monday Night Painting sessions I attended, we worked from a model that struck me as the perfect Daphnis. I did one two-hour oil sketch of him, then decided to redo it on a larger canvas the next week, so I could put the figure into a larger scene, having Daphnis and Chloe in mind. I started to look at images of Daphnis and Chloe through the ages and found there are many, many of them and they are among the loveliest paintings of which there are art prints available. Daphnis and Chloe is a prose poem by Longus, a second century writer, perhaps the first novelist, who lived on the Aegean island of Lesbos (home of Sappho). It’s the story of two foundlings, exposed separately by their parents on a mountainside, who are raised by a goatherd and a shepherd,. They grow up in a idyllic, pastoral playground, herding sheep and playing musical instruments and falling in love, but are too innocent to know what to do about it. The path to marriage and rural domestic happiness is a rocky one, involving Chloe’s abduction by suitors and a raid from a neighboring city, and Daphnis being beaten up and sold to pirates. It all works out in the end though. What an irresistable tale to paint, or for that matter, write a ballet about, like Ravel! 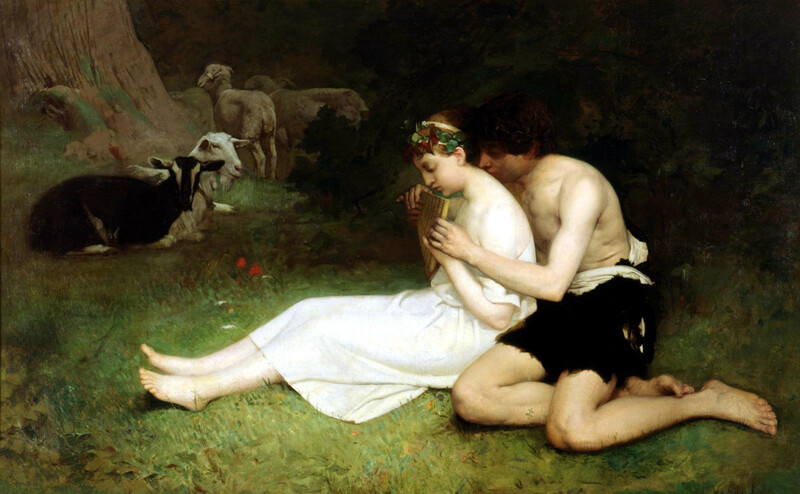 I classify Daphnis and Chloe as an Arcadian type of romance. 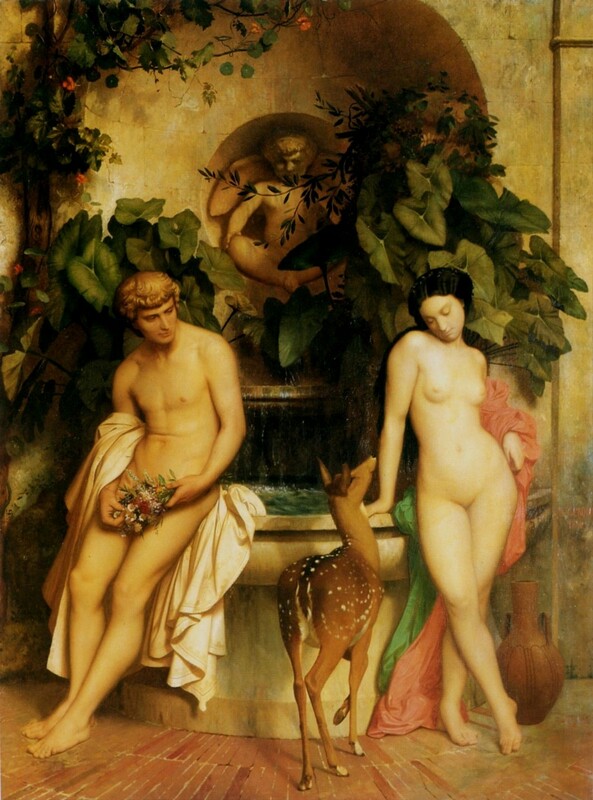 Arcadia, although an actual region in Greece with mountainous topography and a scanty population, became in the minds of poets, reformers and artists a sort of pagan Garden of Eden, where people lived in harmony with each other and the splendor of the natural world, populated by dryads, naiads and, of course, shepherds, and ruled by the god Pan. Virgil set his Eclogues in Arcadia. Arcadia came to represent not a man-made utopia, but the spontaneous result of life lived naturally, uncorrupted by civilization, sort of an 18th Century Enlightment holy-grail of a place. Arcadia was represented in Renaissance Italian art, as they were the immediate heirs of the classical world, but was also taken up by the Elizabethan Sir Philip Sidney, in a long prose work by that title. I’ve never read Sidney’s work, though I have read Longus, but whenever I encountered those Elizabethan sonnets addressed to some lady-fair named Chloris or Phillis or Celia, Diana, Cynthia, Aurora, Diaphenia,…Rosaline, I think, “Yep, those shepherdesses were a canny lot. They knew when not to give into the blandishments of some honey-tongued shepherd whose ardor outstripped his fear of consequences.” What a boon to poetry Arcadia was though! I decided I must post some of the gorgeous paintings I found of Daphnis and Chloe to spur me on to a more ambitious work. Some of my favorite images, I couldn’t copy and paste into this blog entry, so I’ll provide links instead: Jean Leon Gerome, and Jehan George Vibert (this is one of my absolute favorites).